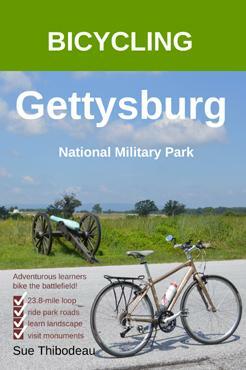 The thrill of flying down Culp’s Hill on a bicycle is an unmatched experience for Gettysburg tourists. 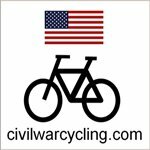 To give you a feel for this exhilarating and all-too-short ride, I posted my GoPro video of the ride on my Civil War Cycling Facebook page. And in this blog post, I provide more geographical and historical context — plus a window to that bicycling video. Culp’s Hill is southeast of the town of Gettysburg. Young Gettysburg native Wesley Culp — a member of the family for whom the hill was named — was living in Virginia when the Civil War started. He joined the Confederate army as a private and fought and died at the Battle of Gettysburg. We do not know where he died or where he is buried. Culp’s Hill was the right anchor of the Union line during the battle. According to the U.S. Geological Survey, the hill is at 629 feet Mean Sea Level. The lowest nearby location is Spangler’s Spring, which is at 469 feet Mean Sea Level. The paved park road from Spangler’s Spring to the summit of Culp’s Hill is a steep 160-foot, 3/4-mile climb up Slocum Avenue, a road that was named after Major General Henry W. Slocum (1826-94), commander of the Union right wing at the Battle of Gettysburg (July 1-3, 1863). The ride down Culp’s Hill is also part of Slocum Avenue. Our video begins at the summit of Culp’s Hill — at an observation tower built in 1895 — and follows Slocum Avenue down (southwest) to Stevens’ Knoll. We end at the road’s intersection with Wainwright Avenue, near a monument to the 33rd MA Infantry. 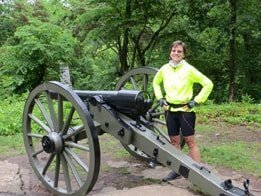 The ride down Culp’s Hill is a fast 0.2 mile glide into Stevens’ Knoll, where — not visible in the video — stand several restored Civil War Era cannon and a couple monuments, most notably the equestrian monument of Major General Henry W. Slocum. We bend north another 0.1 miles to reach the 33rd MA Infantry monument, on our right. East Cemetery Hill is straight-ahead. From the fields to our right, Confederates attacked East Cemetery Hill and Stevens’ Knoll. What Happened at Culp’s Hill? Culp’s Hill marks the Union right. On Culp’s Hill, Union troops dug earthen trenches that prevented Confederates from gaining the high ground, and thus protected the Union line that wrapped west around Cemetery Hill and then south along Cemetery Ridge to Little Round Top. On July 2, 1863, at about 4:00 P.M., Confederate artillery on Benner Hill bombarded Union positions on Culp’s Hill and Stevens’ Knoll. From about 8:00 – 10:00 P.M., Confederate infantry attacked Culp’s Hill from the east (along modern-day East Confederate Avenue). The Union line held. 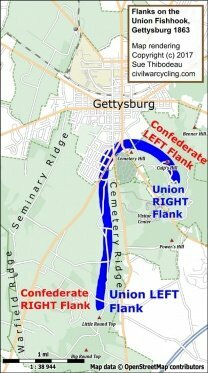 On July 3, 1863, early in the morning, Union infantry on Culp’s Hill launched a surprise attack on the Confederates. By 11:00 A.M., the battlefield action on Culp’s Hill ended with the Confederates falling back. It is interesting to note that the two oldest Union and Confederate generals at the Battle of Gettysburg fought each other on Culp’s Hill. Union general George S. Greene was 62 years old, and Confederate general William Smith was 65 years old.